PR -MEMPHIS, TN — Bountiful Blessing, Inc. will present a host of celebratory activities to commemorate the 75th birthday of its founder and former presiding bishop of the Church of God in Christ, Bishop G. E. Patterson. The events will honor Patterson’s life and legacy while continuing his work to bless the community. Registration fee for the Bishop G. E. Patterson 5K Walk/Run 4Life is $25 before September 15; after that date, the fee is $30. For registration information and event details, call 901-577-2500 or visit http://www.racesonline.com/index.cfm?fuseaction=public.race_detail&race_id=17269 or emailrhughes@porterleath.org. Proceeds will benefit the preschool scholarship program at Porter-Leath. Contributions will benefit the Bountiful Blessings, Inc. television and radio broadcast ministries. Memphis Hilton Hotel, 939 Ridge Lake Blvd. For further Information on general seating call 1-800-544-3571. Proceeds will benefit the outreach ministry of Bountiful Blessings Inc.
Bishop G. E. Patterson died March 20, 2007. His humanitarian efforts and financial contributions to those suffering and in great need endures through the work of Bountiful Blessings, Inc. guided by his wife. The ministry continues to support infant mortality initiatives, children of incarcerated parents, the needs of seniors and the work of area food banks. For over 35 years, Bountiful Blessings, Inc. has been a beacon of hope for needy souls throughout the US. The organization strives to provide individuals and families – from all backgrounds and walks of life – with resources to live healthy and abundant lives. 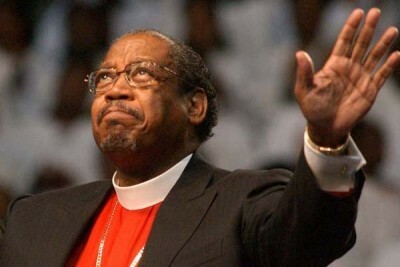 For more information on the events commemorating the 75th birthday of Bishop G. E. Patterson, please call 1-800-544-3571.